Has the time come when a common man is losing temper to break out from the confusion of this system as per his will. The shootout at Kasauli perhaps speaks this story. The first of its kind incidence in Himachal clearly signifies that the blind approach of the various governmental authorities is deplicating the society and environment both. So now for authorities on the front is the sword of justice which passes orders against the unlawful and behind there could be bullets waiting. Regulations shall have to be implemented as per law, and if under any pressure they are compromised, then the common citizen who is getting effected from it could also kill in rage. 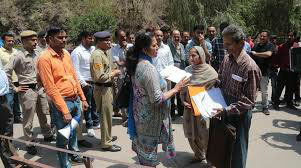 Though for no solution, and neither does the writer vouch in favor of such incidents as in Kasauli. Here in this shootout case the accused Vijay Thakur who allegedly fired three bullets at Shail Bala Sharma the female TCP officer became stooge of this corrupt system and turned into a criminal today. In a video viral on social media it is clearly visible that the accused started with folding hands in vein before the team, which had come to demolish the unauthorized construction. Thereafter this man threatened to take his own life, if the process was further carried. But when nothing stopped after these efforts, the threat of losing his hard earned limited income urged him to kill an innocent life. The ignorant approach towards implementation of regulations has led to the untoward incidence. The authorities created under the constitution, have a key role in development of the society. Yet these authorities are guided by their weak ethical principles, and submit before money, power, threat, or as the case may be. Standing behind one wrongful act, done by some corrupt officials many others find the leverage of doing the same too. And then these cohesive unlawful acts ends up landing the whole system in a state of total confusion, for the courts of law to clear (as in case of Kasauli illegal constructions). The incidence could have been averted if the TCP and town authorities had acted when these illegal constructions were taking place. Then perhaps a common person could have been stopped from investing into this mess of illegality. Even could have been saved from finishing two lives and their families (The TCP official and his own which shall now lead him behind bars). Lessons are learnt and talked after such incidences, but reviewing this incidence says it all. As on May 1 2018 at Kasauli it was in presence of police and other authorities when one person was killed another injured. Even the apex court has taken notice of the incidence as it was under their order that the demolishing drive was carried. And it was the responsibility of the authorities to ensure that the order was implemented smoothly without any threat to life of both (Authorities and the ones effected). The incidence suggests that it is time now perhaps, that authorities start acting proactively and become an important part of building the new India, than just playing in the hands of the rich and influential. Or many other people like Vijay Thakur could be aroused to take law in their hand. As illegal construction only come up with the connivance of the authorities. So why should only one be punished?